Glad to inform that with the release of new OS 4 Apple releases an updated version of their iBooks app for iPhone and iPod touch. The latest version includes several additional features as page background color choice-you can use sepia or white, choice between left or fully justified text layouts and ability to increase the font size even larger. With this update Georgia is available as a new font as well. iBooks 1.1 offers to the users bookmarks, ability to highlight passages and also note-taking capabilities. All above mentioned can stay in sync across your iPhone, iPad, and iPod touch, too. 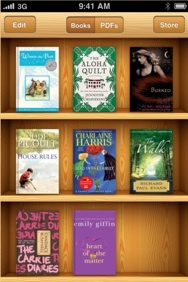 iBooks 1.1 update is universal app for your iPhone / iPad and iPod touch, so hurry up and download now! Herewith, Apple has made Winnie the Pooh available to download for free to iPhone users who install iBooks. Device Requirements: iBooks requires iPhone OS 3.2 or later. Price and availability: iBooks 1.1 is available now for free in the App Store.